When I awoke at six thirty we were headed west for entry into the harbor, going 9.7 knots in clear weather. All of a sudden I heard the foghorn. We were proceeding forward, and we were in very thick fog; so thick the bow section was nearly obscured from the Bridge! I couldn’t sleep till about three in the morning, but when I awoke at seven, we were docked at piers 91 and 92 as usual for San Pedro. I emerged near nine o’clock to link with Lees for their phone call. We had to go aft by the sports deck to get away from the roar of action dockside. We are traveling on course 270˚ presently passing a group of islands (122 small ones) called the Houtman Abrolhos, and coral reefs thirty miles away to the East. The town on Australia’s west coast here is Geraldton. Little motion. I was on deck in time to see the final docking process in the early morning light of seven o’clock. There was a small group of Maoris chanting and then poi ball dancing. My tour was a delightful walk around the historical parts of Parnell, a surprisingly well- preserved near “suburb” of Auckland. The highlight including a HUGE Pehukawa tree, the rose garden, Nancy Steen Garden of all plants and bushes brought from England, Oak trees, Judge’s Bay, Hobson Bay, St. Stephen’s Chapel (1857) made of Kauri wood – designed and built by Benjamin Strange, – Ewelme Cottage (where we heard about boys (his sons) who lived here while attending the nearby school. We had tea and coffee at the Kiner House (Headmaster) of Parnell Grammar School. We finished up at the magnificent St. Mary’s wooden cathedral, which was moved from across the street; also the new cathedral, which reminds me of Coventry Cathedral. Tuesday, 29 January: Montevideo, Uruguay: 34˚ 54.25′ S x 056˚ 12.7 W.
As I write this at 8 a.m. we are doing a 180˚ turn around within the 1000 by 1000’ confined space of the harbor in Montevideo. For several hours the ship worked her way up the narrow dredged channel of the River Plate, and when ready to do the 90˚ square turn to starboard, two tugs pushed on the bow and the counter thrust had to be made on starboard stern to pivot us on the mid-ships. There was a while there when vast amounts of mud were stirred up as the tugs labored to turn us. I think we were scraping the bottom. The buses (no where near as many as in 2006 with QM2) are already waiting for us, and no doubt they (the drivers) are presently enjoying the spectacle of the 180˚ turning within the small space. 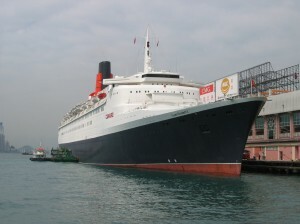 This is the last time she was docked at this Hong Kong Terminal. We entered Durban Harbor at seven o’clock, turned the corner starboard and halted quite a while as if suspended, but upon reaching topside, it was clearly because we docked at a corner and the next ship forward was at 90˚ to us. We are at the Passenger ship terminal in the middle section! A mock Zulu tribal greeting and “war” was taking place with multiple deep drums, spears etc., and agile tumblers. Liner Lady uses WordPress as content manager.